Timothy Lydon passed away on 2 March & Edward Anketell Jones passed away on 4 March. Inishshanboe is in the civil parish of Kilcummin. The civil Parish corresponds with the following Church of Ireland parish of Kilcummin, Galway West. In general, the civil parish and the Church of Ireland parish are the same as is the case in the Kilcummin Oughterard area. Inishshanboe Contains 16¾ acres all under tillage and pasture. It is also inhabited. Situated S.W. of Urkaunbeg and S.E. of the Bronteen Islands. In Lough Corrib. It belongs to the townland of Lemonfield. O’Flaherty is a member of the O’Flahertie (Lemonfield) family. Tithes were a tax on agricultural produce which was payable by the occupiers of agricultural land. They were the main source of income for the parish clergy of the Church of Ireland (the largest Protestant church and the church established by law). However, in many parishes a large part of the tithes was ‘appropriate’, which meant that they were payable to a bishop, cathedral chapter or other ecclesiastical recipient, or were ‘impropriate’, which generally meant that they were payable to a local landowner. The parishes used in the Tithe Applotment Books are civil or Church of Ireland parishes, which often differ in name and territory from Catholic parishes, Acts of Parliament of 1823 and 1832 provided for the conversion of tithes into a fixed charge on land, and specified the average price of wheat or oats in the parish in the seven years before 1821 as the basis on which the tithes would be calculated. They also extended the application of tithes to pasture, where previously they had been levied only on tillage. This change in the law resulted in the valuation of individual holdings in almost all parishes containing agricultural land, in order to assess the portion of the tithes for which each occupier of land would be liable. The apportionment was recorded for each Church of Ireland parish in a Tithe Composition Applotment Book. The information was collected and the amounts were calculated by two Parochial Commissioners, one of whom was appointed by the cess-payers of the parish and the other by the relevant Diocese of the Church of Ireland. This procedure was carried out in over 2,500 parishes between the years 1823 and 1837. The Tithe Applotment Books are in a variety of formats, from a few pages sewn together to elaborately bound volumes. In most cases they are written in manuscript throughout, although some consist of manuscript entries on printed questionnaires. The information in the books is broadly uniform and generally includes at least the name of occupier; the size of holding, the valuation and the tithe payable. In some cases, more detailed information is provided. Some volumes have maps and most have certificates and correspondence attached. The sub-divisions of the parish were recorded. Some of these subdivisions, such as plough lands, ceased to be in official use after the six-inch survey of the Ordnance Survey was completed in the 1840s. Only productive land was subject to tithe, and the books usually distinguish between this tithable land and untithable land such as roads or mountains. Tithable land was in some cases classified by quality, and a money value was given to each class. In some cases, the proportion of tithe payable to the rector, vicar or lay proprietor of the tithes was set out. The column for observations was sometimes completed, with information about commonage, for example. In Griffith’s valuation the area was 16 acres, 1 rood & 1 perch of land, there was no rateable value list for Inishshanboe on its own. Immediate Lessors – George F. O’Flahertie. The division of the country into Poor Law Unions based on Irish electoral divisions which were made up from townlands. Initially, 130 Unions were created, based upon 2,049 electoral divisions. The divisions were composed of townlands, a peculiarly Irish unit, traditionally of 120 Irish acres in area. (Between 1848 and 1850, subdividing and reorganizing the boundaries of some existing Unions, particularly in the west of the country created an additional 33 Unions. Boards of Guardians were elected annually on 25th March. Only ratepayers were eligible for election, which effectively disenfranchised most of the native Irish who were usually tenants at this time. Ratepayers were allowed between one and six votes depending on the size of a valuation of their property. A townland is one of the smallest land divisions in Ireland. They range in size from a few acres to thousands of acres. Many are Gaelic in origin, but some came into existence after the Norman invasion of 1169. Inishshanboe is a townland. 1881 – 1 house (1 inhabited) with 9 people (6 males, 3 females). There were 2 outbuildings. The valuation of Houses & Land in 1881 was £11 0s 0d. 1891 – 2 houses (1 inhabited) with 3 people (2 males, 1 female). There were 3 outbuildings. The valuation of Houses & Land in 1891 was £11 0s 0d. 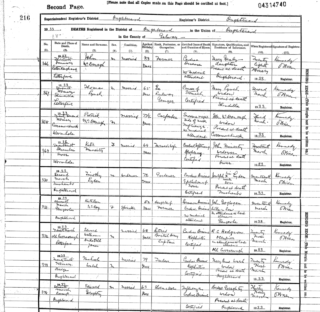 This is a return of the members of the family, visitors, boarders or servants who slept or abode in their house on the night of Sunday March 31st 1901 in Inishshanboe. 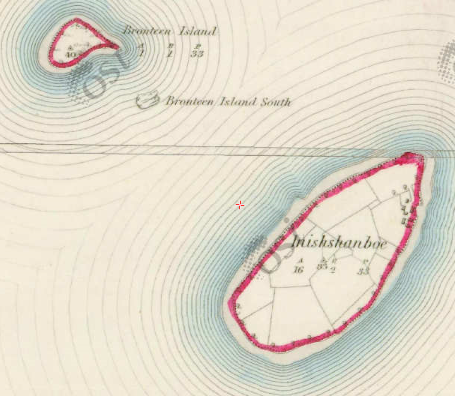 There were 2 houses listed in the Townland of Inishshanboe. There were 5 Roman Catholics & 1 Church of Irish; they were born in Co. Galway & Sussex. 6 people lived in Inishshanboe (4 males and 2 females) in the townland. There were 12 farm buildings and out offices which included cow house, potato house, 3 fowl houses, turf house, workshop, shed, store, boat house & paint house. Edward William Aucketell Jones aged 36 was head of the family; he was married. Edward was a Gentleman, Retired Captain of H.M. Army & J.P. for County Galway. Edward could read & write. He was born in Sussex. He was Church of Ireland. He lived in a 1st class house with 6 rooms and 8 front windows. He had a cow house, potato house, 3 fowl houses, turf house, workshop, store, boat house & paint house. This was a private dwelling. Thady Lydon aged 39 was head of the family; married to Susan aged 32. They lived with their children Patrick aged 15, Joseph aged 8 & Mary Anne aged 9 months. Thady was a sailor; he could not read. Susan was a housekeeper; she could read and write and spoke Irish & English. Patrick was a farm labourer; he could read & write. Joseph & Mary Anne could not read. They lived in a 2nd class house with 3 rooms and 6 front windows. They had a shed. This was a private dwelling. This is a return of the Members of the families in Inishshanboe, their visitors, boarders and servants who slept or abode in the house on the night of Sunday 2nd April 1911. There were 2 houses (2 uninhabited) listed in the Townland of Inishshanboe. Of the people living in Inishshanboe all 8 (3 males/5 females) 5 were Roman Catholics & 3 Church of Ireland. People that lived in Inishshanboe were born in Galway, England, Cavan, Wicklow. There were a total of 11 farm buildings and out offices which included cow houses, calf house, fowl house, turf house, workshop, sheds, store, kennel a boat house. Edward William Anketell-Jones aged 46 was head of the family; married. He lived with widow Ruth Metaxa aged 32, a visitor; niece Thelma Louisa Evelyne H Metaxa aged 7 & Elizabeth Kelly aged 34; single. Edward was a retired captain in the Army & J.P. (Justice of the Peace) for Co Galway; born in England. Ruth was a countess; born in Cavan & Thelma was a countess & scholar; born in England. They were Church of Ireland. Elizabeth was a cook; born in Wicklow. She was Roman Catholic. The entire household could read & write. 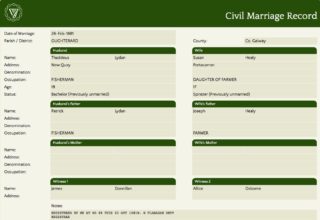 Ruth was married for 10 years; she had 2 children with both living at the time of the census. They lived in a 1st class house with 6 rooms and 9 front windows. They had 2 cow houses, calf house, fowl house, turf house, workshop, 2 sheds, store, kennel a boat house. This was a private dwelling. Thomas Lydon aged 55 was head of the family; a widower. He lived with his son Joseph aged 18, daughter Mary Anne aged 11 & widowed mother-in-law Mary Healy aged 70. Thomas was a caretaker; Joseph was a labourer. The entire family could not read. Thomas & Mary spoke Irish & English. They were Roman Catholic. They lived in a 2nd class house with 2 rooms and 3 front windows. This was a private dwelling. 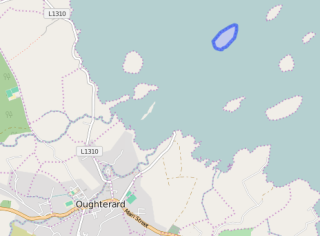 Inishshanboe is in the civil parish of Kilcummin. It is located at 53° 27′ 9″ N, 9° 17′ 28″ W.
You can use this link to view a map of archaeological features. This link brings you to a website wherein you will have to search for your townland. 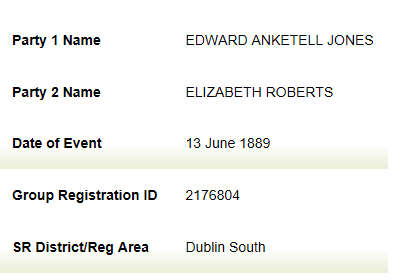 Following on having received an email from a relative of Edward Anketell- Jones, I did researched and found that Edward married Elizabeth Roberts in 1889 (see attached record). Edward passed away in March 1933 and by strange coincidence Timothy (Thady) Lydon who worked on Inishshanboe for many years passed away just 2 days before Edward. 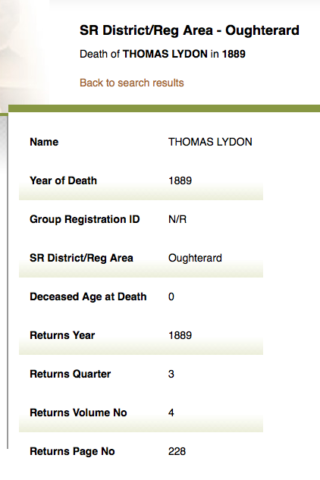 They Lydon Family are listed on both the 1901 & !911 Census. 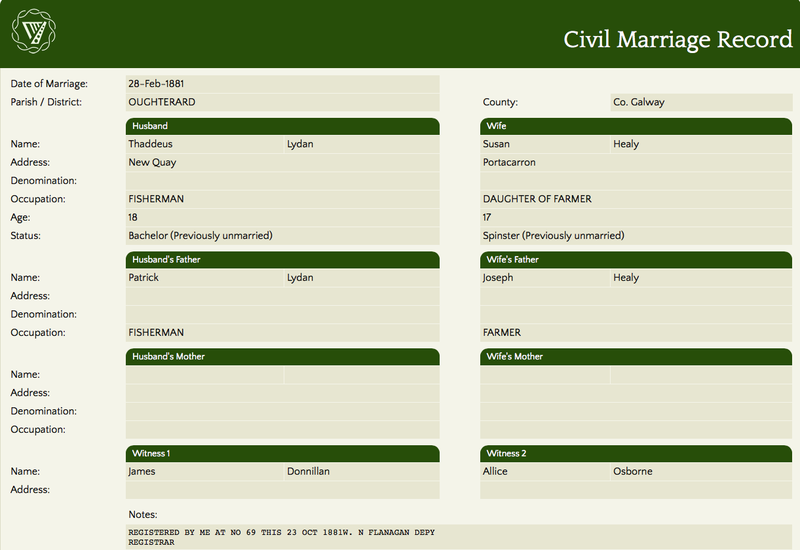 Timothy & Susan (Healy) married in Feb 1881. They had 5 children (records found for 5). Patrick born 1885, Thomas born 1889 and sadly passed away that year, Joseph born 1892, James born 1898, passed away in 1899 & Mary Anne born in 1900. Susan passed away in 1905. This page was added on 17/07/2016. 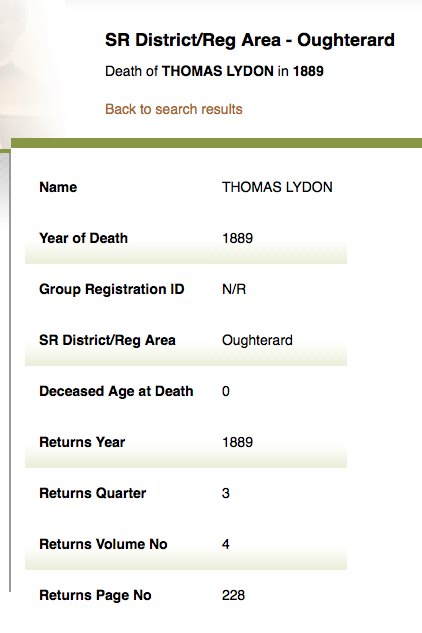 I believe these Lydons are part of my family although I haven’t done extensive research. I was brought up in Enland, being told that my Lydon family worked and lived on a small island on Loch Corrib as laborours/ helpers for a fine house. I had no other details. 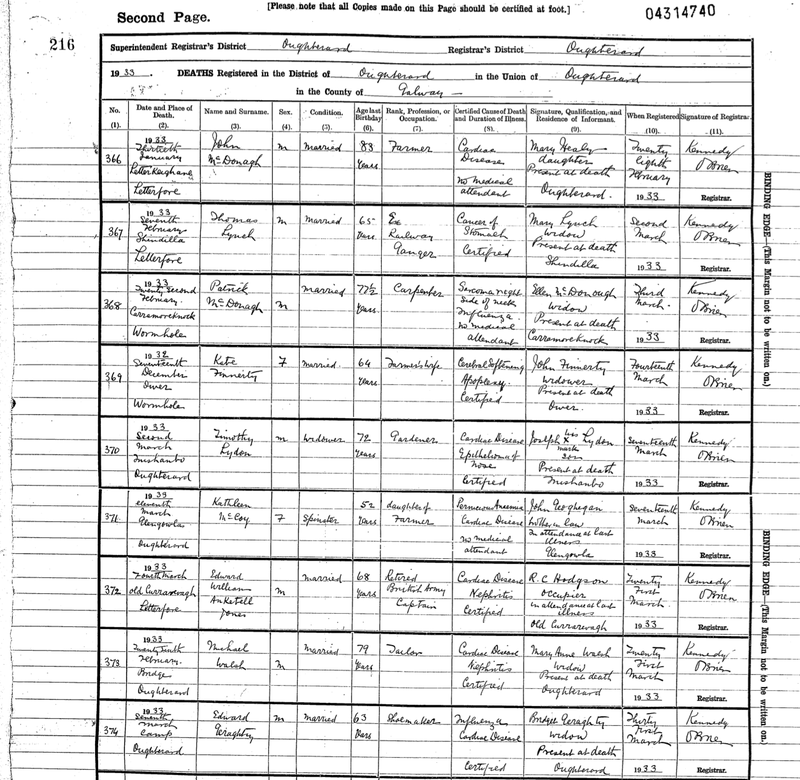 Looking at this research, I think my Great grandfather, who came to Liverpool in the 1800s could have been Thady’s brother/ cousin? My grandfather, John Lydon was then born in Liverpool in 1888. I hope to come to the area in 2020 to make sense of it. As an Anketell-Jones family member I can tell you that Ruth Metaxa was the younger sister of Edward W Anketell-Jones of Inishanboe. She was the widow of Count Metaxa to whom she was married for 3 years and by whom she had a son and a daughter. She was born in Cavan in 1877/8. 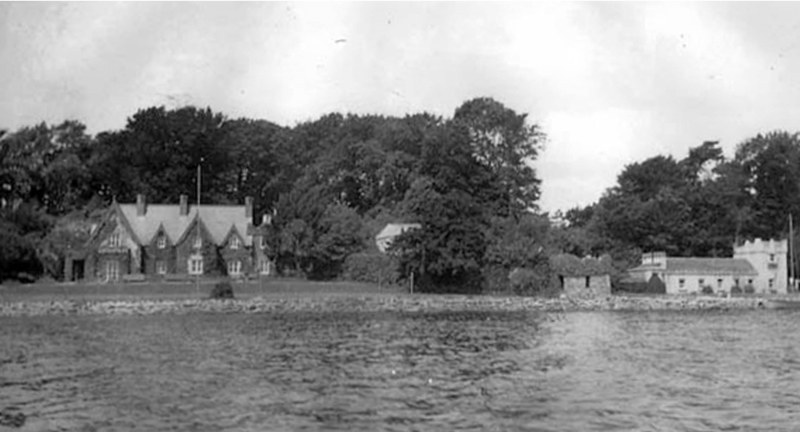 She returned to Ireland and lived in Oughterard at Gort-n-Gavin.